The first suggestion to Rafe Pomerance that humankind was destroying the conditions necessary for its own survival came on Page 66 of the government publication EPA-600/7-78-019. It was a technical report about coal, bound in a coal-black cover with beige lettering — one of many such reports that lay in uneven piles around Pomerance’s windowless office on the first floor of the Capitol Hill townhouse that, in the late 1970s, served as the Washington headquarters of Friends of the Earth. In the final paragraph of a chapter on environmental regulation, the coal report’s authors noted that the continued use of fossil fuels might, within two or three decades, bring about “significant and damaging” changes to the global atmosphere. Pomerance paused, startled, over the orphaned paragraph. It seemed to have come out of nowhere. He reread it. It made no sense to him. Pomerance was not a scientist; he graduated from Cornell 11 years earlier with a degree in history. He had the tweedy appearance of an undernourished doctoral student emerging at dawn from the stacks. He wore horn-rimmed glasses and a thickish mustache that wilted disapprovingly over the corners of his mouth, though his defining characteristic was his gratuitous height, 6 feet 4 inches, which seemed to embarrass him; he stooped over to accommodate his interlocutors. He had an active face prone to breaking out in wide, even maniacal grins, but in composure, as when he read the coal pamphlet, it projected concern. He struggled with technical reports. He proceeded as a historian might: cautiously, scrutinizing the source material, reading between the lines. When that failed, he made phone calls, often to the authors of the reports, who tended to be surprised to hear from him. Scientists, he had found, were not in the habit of fielding questions from political lobbyists. They were not in the habit of thinking about politics. The reporting and photography for this project were supported by a major grant from the Pulitzer Center, which has also created lesson plans to bring the climate issue to students everywhere. Pomerance had one big question about the coal report. If the burning of coal, oil and natural gas could invite global catastrophe, why had nobody told him about it? If anyone in Washington — if anyone in the United States — should have been aware of such a danger, it was Pomerance. As the deputy legislative director of Friends of the Earth, the wily, pugnacious nonprofit that David Brower helped found after resigning from the Sierra Club a decade earlier, Pomerance was one of the nation’s most connected environmental activists. That he was as easily accepted in the halls of the Dirksen Senate Office Building as at Earth Day rallies might have had something to do with the fact that he was a Morgenthau — the great-grandson of Henry Sr., Woodrow Wilson’s ambassador to the Ottoman Empire; great-nephew of Henry Jr., Franklin D. Roosevelt’s Treasury secretary; second cousin to Robert, district attorney for Manhattan. Or perhaps it was just his charisma — voluble, energetic and obsessive, he seemed to be everywhere, speaking with everyone, in a very loud voice, at once. His chief obsession was air. 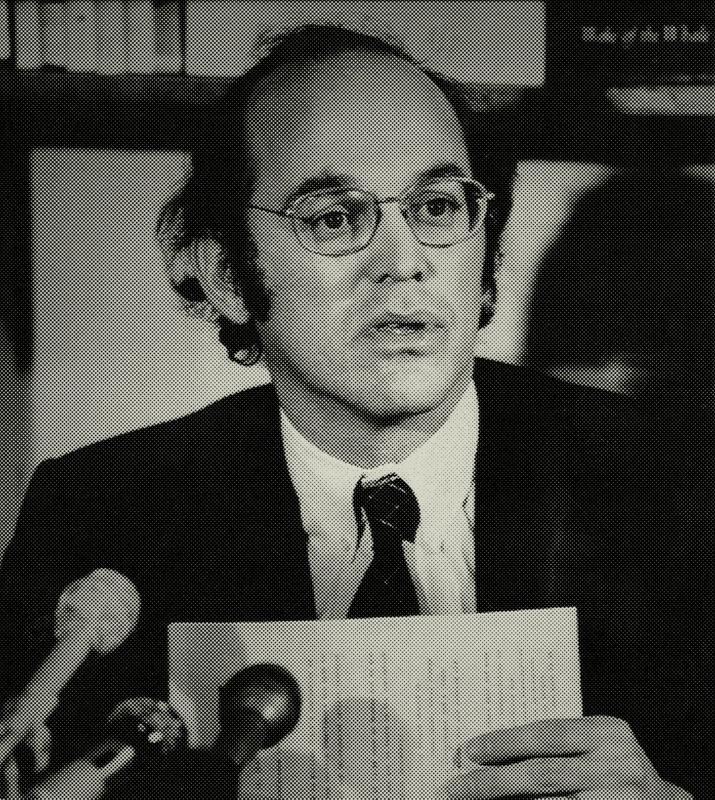 After working as an organizer for welfare rights, he spent the second half of his 20s laboring to protect and expand the Clean Air Act, the comprehensive law regulating air pollution. That led him to the problem of acid rain, and the coal report. He showed the unsettling paragraph to his office mate, Betsy Agle. Had she ever heard of the “greenhouse effect”? Was it really possible that human beings were overheating the planet? Agle shrugged. She hadn’t heard about it, either. That might have been the end of it, had Agle not greeted Pomerance in the office a few mornings later holding a copy of a newspaper forwarded by Friends of the Earth’s Denver office. Isn’t this what you were talking about the other day? she asked. In the decade since then, MacDonald had been alarmed to see humankind begin in earnest to weaponize weather — not out of malice, but unwittingly. During the spring of 1977 and the summer of 1978, the Jasons met to determine what would happen once the concentration of carbon dioxide in the atmosphere doubled from pre-Industrial Revolution levels. It was an arbitrary milestone, the doubling, but a useful one, as its inevitability was not in question; the threshold would most likely be breached by 2035. The Jasons’ report to the Department of Energy, “The Long-Term Impact of Atmospheric Carbon Dioxide on Climate,” was written in an understated tone that only enhanced its nightmarish findings: Global temperatures would increase by an average of two to three degrees Celsius; Dust Bowl conditions would “threaten large areas of North America, Asia and Africa”; access to drinking water and agricultural production would fall, triggering mass migration on an unprecedented scale. “Perhaps the most ominous feature,” however, was the effect of a changing climate on the poles. Even a minimal warming “could lead to rapid melting” of the West Antarctic ice sheet. The ice sheet contained enough water to raise the level of the oceans 16 feet. The Jasons sent the report to dozens of scientists in the United States and abroad; to industry groups like the National Coal Association and the Electric Power Research Institute; and within the government, to the National Academy of Sciences, the Commerce Department, the E.P.A., NASA, the Pentagon, the N.S.A., every branch of the military, the National Security Council and the White House. Gordon MacDonald worked at the federally funded Mitre Corporation, a think tank that works with agencies throughout the government. His title was senior research analyst, which was another way of saying senior science adviser to the national-intelligence community. After a single phone call, Pomerance, a former Vietnam War protester and conscientious objector, drove several miles on the Beltway to a group of anonymous white office buildings that more closely resembled the headquarters of a regional banking firm than the solar plexus of the American military-industrial complex. He was shown into the office of a brawny, soft-spoken man in blocky, horn-rimmed frames, who extended a hand like a bear’s paw. MacDonald explained that he first studied the carbon-dioxide issue when he was about Pomerance’s age — in 1961, when he served as an adviser to John F. Kennedy. Pomerance pieced together that MacDonald, in his youth, had been something of a prodigy: In his 20s, he advised Dwight D. Eisenhower on space exploration; at 32, he became a member of the National Academy of Sciences; at 40, he was appointed to the inaugural Council on Environmental Quality, where he advised Richard Nixon on the environmental dangers of burning coal. He monitored the carbon-dioxide problem the whole time, with increasing alarm. Thus began the Gordon and Rafe carbon-dioxide roadshow. Beginning in the spring of 1979, Pomerance arranged informal briefings with the E.P.A., the National Security Council, The New York Times, the Council on Environmental Quality and the Energy Department, which, Pomerance learned, had established an Office of Carbon Dioxide Effects two years earlier at MacDonald’s urging. The men settled into a routine, with MacDonald explaining the science and Pomerance adding the exclamation points. They were surprised to learn how few senior officials were familiar with the Jasons’ findings, let alone understood the ramifications of global warming. At last, having worked their way up the federal hierarchy, the two went to see the president’s top scientist, Frank Press. Press’s office was in the Old Executive Office Building, the granite fortress that stands on the White House grounds just paces away from the West Wing. Out of respect for MacDonald, Press had summoned to their meeting what seemed to be the entire senior staff of the president’s Office of Science and Technology Policy — the officials consulted on every critical matter of energy and national security. What Pomerance had expected to be yet another casual briefing assumed the character of a high-level national-security meeting. He decided to let MacDonald do all the talking. There was no need to emphasize to Press and his lieutenants that this was an issue of profound national significance. The hushed mood in the office told him that this was already understood. To explain what the carbon-dioxide problem meant for the future, MacDonald would begin his presentation by going back more than a century to John Tyndall — an Irish physicist who was an early champion of Charles Darwin’s work and died after being accidentally poisoned by his wife. In 1859, Tyndall found that carbon dioxide absorbed heat and that variations in the composition of the atmosphere could create changes in climate. These findings inspired Svante Arrhenius, a Swedish chemist and future Nobel laureate, to deduce in 1896 that the combustion of coal and petroleum could raise global temperatures. This warming would become noticeable in a few centuries, Arrhenius calculated, or sooner if consumption of fossil fuels continued to increase. Consumption increased beyond anything the Swedish chemist could have imagined. Four decades later, a British steam engineer named Guy Stewart Callendar discovered that, at the weather stations he observed, the previous five years were the hottest in recorded history. Humankind, he wrote in a paper, had become “able to speed up the processes of Nature.” That was in 1939. MacDonald’s voice was calm but authoritative, his powerful, heavy hands conveying the force of his argument. He was a geophysicist trapped in the body of an offensive lineman — he had turned down a football scholarship to Rice in order to attend Harvard — and seemed miscast as a preacher of atmospheric physics and existential doom. His audience listened in bowed silence. Pomerance couldn’t read them. Political bureaucrats were skilled at hiding their opinions. Pomerance wasn’t. He shifted restlessly in his chair, glancing between MacDonald and the government suits, trying to see whether they grasped the shape of the behemoth that MacDonald was describing. MacDonald’s history concluded with Roger Revelle, perhaps the most distinguished of the priestly caste of government scientists who, since the Manhattan Project, advised every president on major policy; he had been a close colleague of MacDonald and Press since they served together under Kennedy. In a 1957 paper written with Hans Suess, Revelle concluded that “human beings are now carrying out a large-scale geophysical experiment of a kind that could not have happened in the past nor be reproduced in the future.” Revelle helped the Weather Bureau establish a continuous measurement of atmospheric carbon dioxide at a site perched near the summit of Mauna Loa on the Big Island of Hawaii, 11,500 feet above the sea — a rare pristine natural laboratory on a planet blanketed by fossil-fuel emissions. A young geochemist named Charles David Keeling charted the data. Keeling’s graph came to be known as the Keeling curve, though it more closely resembled a jagged lightning bolt hurled toward the firmament. 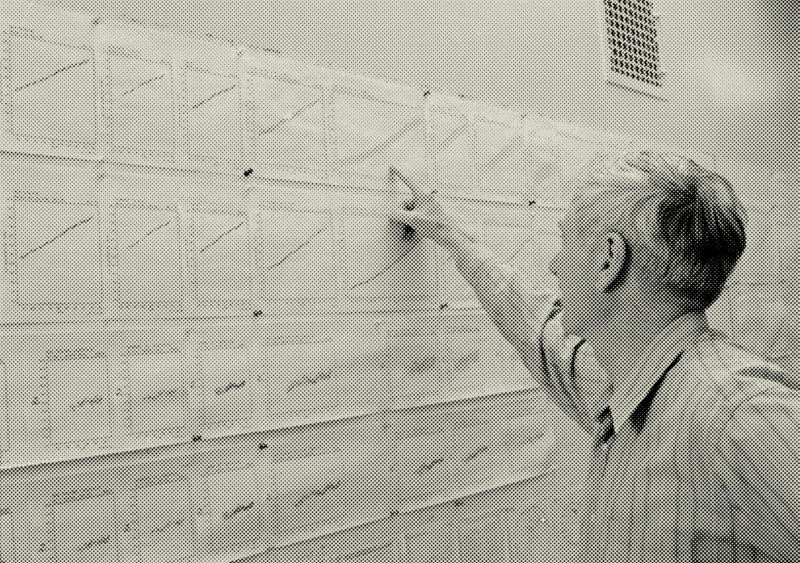 MacDonald had a habit of tracing the Keeling curve in the air, his thick forefinger jabbing toward the ceiling. After nearly a decade of observation, Revelle had shared his concerns with Lyndon Johnson, who included them in a special message to Congress two weeks after his inauguration. Johnson explained that his generation had “altered the composition of the atmosphere on a global scale” through the burning of fossil fuels, and his administration commissioned a study of the subject by his Science Advisory Committee. Revelle was its chairman, and its 1965 executive report on carbon dioxide warned of the rapid melting of Antarctica, rising seas, increased acidity of fresh waters — changes that would require no less than a coordinated global effort to forestall. In 1974, the C.I.A. issued a classified report on the carbon-dioxide problem. It concluded that climate change had begun around 1960 and had “already caused major economic problems throughout the world.” The future economic and political impacts would be “almost beyond comprehension.” Yet emissions continued to rise, and at this rate, MacDonald warned, they could see a snowless New England, the swamping of major coastal cities, as much as a 40 percent decline in national wheat production, the forced migration of about one-quarter of the world’s population. Not within centuries — within their own lifetimes. “What would you have us do?” Press asked. The president’s plan, in the wake of the Saudi oil crisis, to promote solar energy — he had gone so far as to install 32 solar panels on the roof of the White House to heat his family’s water — was a good start, MacDonald thought. But Jimmy Carter’s plan to stimulate production of synthetic fuels — gas and liquid fuel extracted from shale and tar sands — was a dangerous idea. Nuclear power, despite the recent tragedy at Three Mile Island, should be expanded. But even natural gas and ethanol were preferable to coal. There was no way around it: Coal production would ultimately have to end. The president’s advisers asked respectful questions, but Pomerance couldn’t tell whether they were persuaded. The men all stood and shook hands, and Press led MacDonald and Pomerance out of his office. After they emerged from the Old Executive Office Building onto Pennsylvania Avenue, Pomerance asked MacDonald what he thought would happen. Knowing Frank as I do, MacDonald said, I really couldn’t tell you. In the days that followed, Pomerance grew uneasy. Until this point, he had fixated on the science of the carbon-dioxide issue and its possible political ramifications. But now that his meetings on Capitol Hill had concluded, he began to question what all this might mean for his own future. His wife, Lenore, was eight months pregnant; was it ethical, he wondered, to bring a child onto a planet that before much longer could become inhospitable to life? And he wondered why it had fallen to him, a 32-year-old lobbyist without scientific training, to bring greater attention to this crisis. Finally, weeks later, MacDonald called to tell him that Press had taken up the issue. On May 22, Press wrote a letter to the president of the National Academy of Sciences requesting a full assessment of the carbon-dioxide issue. Jule Charney, the father of modern meteorology, would gather the nation’s top oceanographers, atmospheric scientists and climate modelers to judge whether MacDonald’s alarm was justified — whether the world was, in fact, headed to cataclysm. Pomerance was amazed by how much momentum had built in such a short time. Scientists at the highest levels of government had known about the dangers of fossil-fuel combustion for decades. Yet they had produced little besides journal articles, academic symposiums, technical reports. Nor had any politician, journalist or activist championed the issue. That, Pomerance figured, was about to change. If Charney’s group confirmed that the world was careering toward an existential crisis, the president would be forced to act. When Hurricane Harvey struck Texas last summer, record rainfall caused catastrophic flooding. In six days, as much as 60 inches of rain fell, leaving at least 68 people dead and $125 billion in damage. One study found that climate change has made cataclysmic rain events like Harvey three times as common as they were. Harvey was a particularly slow-moving hurricane, making it significantly more destructive: The storm stood still and drenched already flood-prone areas. “There’s a good chance another event like Harvey will happen again,” said Adam Sobel, the director of Columbia University’s Initiative on Extreme Weather and Climate. “This is the kind of thing we expect to see more and more, even if we stop emitting carbon today.” — Text by Jaime Lowe. Photographs by George Steinmetz for The New York Times. There was a brown velvet love seat in the living room of James and Anniek Hansen, under a bright window looking out on Morningside Park in Manhattan, that nobody ever sat in. Erik, their 2-year-old son, was forbidden to go near it. The ceiling above the couch sagged ominously, as if pregnant with some alien life form, and the bulge grew with each passing week. Jim promised Anniek that he would fix it, which was only fair, because it had been on his insistence that they gave up the prospect of a prewar apartment in Spuyten Duyvil overlooking the Hudson and moved from Riverdale to this two-story walk-up with crumbling walls, police-siren lullabies and gravid ceiling. Jim had resented the 45-minute commute to NASA’s Goddard Institute for Space Studies in Manhattan and complained that such a gross waste of his time would soon be unsustainable, once the Pioneer spacecraft reached Venus and began to beam back data. But even after the Hansens moved within a few blocks of the institute, Jim couldn’t make time for the ceiling, and after four months it finally burst, releasing a confetti of browned pipes and splintered wood. Jim repeated his vow to fix the ceiling as soon as he had a moment free from work. Anniek held him to his word, though it required her to live with a hole in her ceiling until Thanksgiving — seven months of plaster dust powdering the love seat. Another promise Jim made to Anniek: He would make it home for dinner every night by 7 p.m. By 8:30, however, he was back at his calculations. Anniek did not begrudge him his deep commitment to his work; it was one of the things she loved about him. Still, it baffled her that the subject of his obsession should be the atmospheric conditions of a planet more than 24 million miles away. It baffled Jim, too. His voyage to Venus from Denison, Iowa, the fifth child of a diner waitress and an itinerant farmer turned bartender, had been a series of bizarre twists of fate over which he claimed no agency. It was just something that happened to him. Hansen figured he was the only scientist at the National Aeronautics and Space Administration who, as a child, did not dream of outer space. He dreamed only of baseball. On clear nights, his transistor radio picked up the broadcast of the Kansas City Blues, the New York Yankees’ AAA affiliate. Every morning, he cut out the box scores, pasted them into a notebook and tallied statistics. Hansen found comfort in numbers and equations. He majored in math and physics at the University of Iowa, but he never would have taken an interest in celestial matters were it not for the unlikely coincidence of two events during the year he graduated: the eruption of a volcano in Bali and a total eclipse of the moon. On the night of Dec. 30, 1963 — whipping wind, 12 degrees below zero — Hansen accompanied his astronomy professor to a cornfield far from town. They set a telescope in an old corncrib and, between 2 and 8 in the morning, made continuous photoelectric recordings of the eclipse, pausing only when the extension cord froze and when they dashed to the car for a few minutes to avoid frostbite. During an eclipse, the moon resembles a tangerine or, if the eclipse is total, a drop of blood. But this night, the moon vanished altogether. Hansen made the mystery the subject of his master’s thesis, concluding that the moon had been obscured by the dust erupted into the atmosphere by Mount Agung, on the other side of the planet from his corncrib, six months earlier. The discovery led to his fascination with the influence of invisible particles on the visible world. You could not make sense of the visible world until you understood the whimsies of the invisible one. One of the leading authorities on the invisible world happened to be teaching then at Iowa: James Van Allen made the first major discovery of the space age, identifying the two doughnut-shaped regions of convulsing particles that circle Earth, now known as the Van Allen belts. At Van Allen’s prodding, Hansen turned from the moon to Venus. Why, he tried to determine, was its surface so hot? In 1967, a Soviet satellite beamed back the answer: The planet’s atmosphere was mainly carbon dioxide. Though once it may have had habitable temperatures, it was believed to have succumbed to a runaway greenhouse effect: As the sun grew brighter, Venus’s ocean began to evaporate, thickening the atmosphere, which forced yet greater evaporation — a self-perpetuating cycle that finally boiled off the ocean entirely and heated the planet’s surface to more than 800 degrees Fahrenheit. At the other extreme, Mars’s thin atmosphere had insufficient carbon dioxide to trap much heat at all, leaving it about 900 degrees colder. Earth lay in the middle, its Goldilocks greenhouse effect just strong enough to support life. Anniek expected Jim’s professional life to resume some semblance of normality once the data from Venus had been collected and analyzed. But shortly after Pioneer entered Venus’s atmosphere, Hansen came home from the office in an uncharacteristic fervor — with an apology. The prospect of two or three more years of intense work had sprung up before him. NASA was expanding its study of Earth’s atmospheric conditions. Hansen had already done some work on Earth’s atmosphere for Jule Charney at the Goddard Institute, helping to develop computerized weather models. Now Hansen would have an opportunity to apply to Earth the lessons he had learned from Venus. We want to learn more about Earth’s climate, Jim told Anniek — and how humanity can influence it. He would use giant new supercomputers to map the planet’s atmosphere. They would create Mirror Worlds: parallel realities that mimicked our own. These digital simulacra, technically called “general circulation models,” combined the mathematical formulas that governed the behavior of the sea, land and sky into a single computer model. Unlike the real world, they could be sped forward to reveal the future. Anniek’s disappointment — another several years of distraction, stress, time spent apart from family — was tempered, if only slightly, by the high strain of Jim’s enthusiasm. She thought she understood it. Does this mean, she asked, that you’ll able to predict weather more accurately? Yes, Jim said. Something like that. The scientists summoned by Jule Charney to judge the fate of civilization arrived on July 23, 1979, with their wives, children and weekend bags at a three-story mansion in Woods Hole, on the southwestern spur of Cape Cod. They would review all the available science and decide whether the White House should take seriously Gordon MacDonald’s prediction of a climate apocalypse. The Jasons had predicted a warming of two or three degrees Celsius by the middle of the 21st century, but like Roger Revelle before them, they emphasized their reasons for uncertainty. Charney’s scientists were asked to quantify that uncertainty. They had to get it right: Their conclusion would be delivered to the president. But first they would hold a clambake. They gathered with their families on a bluff overlooking Quissett Harbor and took turns tossing mesh produce bags stuffed with lobster, clams and corn into a bubbling caldron. While the children scrambled across the rolling lawn, the scientists mingled with a claque of visiting dignitaries, whose status lay somewhere between chaperone and client — men from the Departments of State, Energy, Defense and Agriculture; the E.P.A. ; the National Oceanic and Atmospheric Administration. They exchanged pleasantries and took in the sunset. It was a hot day, high 80s, but the harbor breeze was salty and cool. It didn’t look like the dawning of an apocalypse. The government officials, many of them scientists themselves, tried to suppress their awe of the legends in their presence: Henry Stommel, the world’s leading oceanographer; his protégé, Carl Wunsch, a Jason; the Manhattan Project alumnus Cecil Leith; the Harvard planetary physicist Richard Goody. These were the men who, in the last three decades, had discovered foundational principles underlying the relationships among sun, atmosphere, land and ocean — which is to say, the climate. The hierarchy was made visible during the workshop sessions, held in the carriage house next door: The scientists sat at tables arranged in a rectangle, while their federal observers sat along the room’s perimeter, taking in the action as at a theater in the round. The first two days of meetings didn’t make very good theater, however, as the scientists reviewed the basic principles of the carbon cycle, ocean circulation, radiative transfer. On the third day, Charney introduced a new prop: a black speaker, attached to a telephone. He dialed, and Jim Hansen answered. Charney called Hansen because he had grasped that in order to determine the exact range of future warming, his group would have to venture into the realm of the Mirror Worlds. 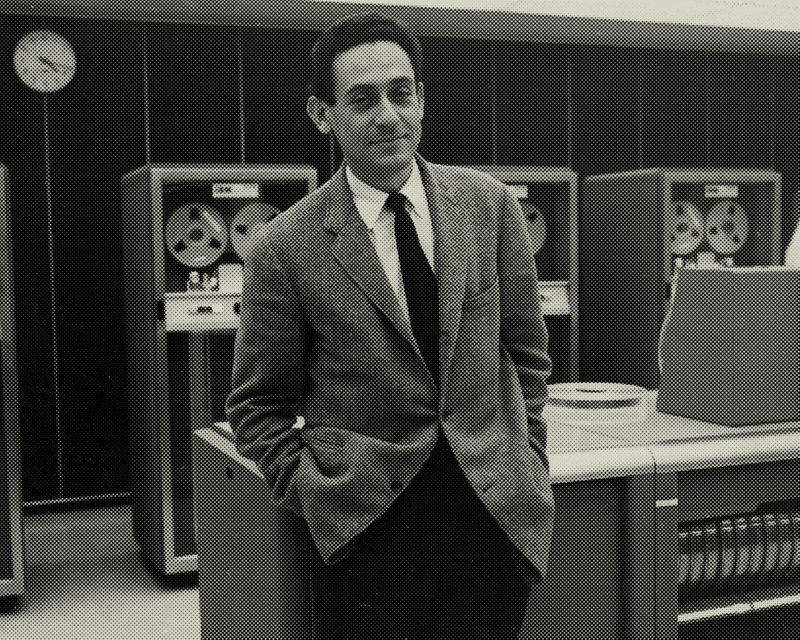 Jule Charney himself had used a general circulation model to revolutionize weather prediction. But Hansen was one of just a few modelers who had studied the effects of carbon emissions. When, at Charney’s request, Hansen programmed his model to consider a future of doubled carbon dioxide, it predicted a temperature increase of four degrees Celsius. That was twice as much warming as the prediction made by the most prominent climate modeler, Syukuro Manabe, whose government lab at Princeton was the first to model the greenhouse effect. The difference between the two predictions — between warming of two degrees Celsius and four degrees Celsius — was the difference between damaged coral reefs and no reefs whatsoever, between thinning forests and forests enveloped by desert, between catastrophe and chaos. In the carriage house, the disembodied voice of Jim Hansen explained, in a quiet, matter-of-fact tone, how his model weighed the influences of clouds, oceans and snow on warming. The older scientists interrupted, shouting questions; when they did not transmit through the telephone, Charney repeated them in a bellow. The questions kept coming, often before their younger respondent could finish his answers, and Hansen wondered if it wouldn’t have been easier for him to drive the five hours and meet with them in person. Among Charney’s group was Akio Arakawa, a pioneer of computer modeling. On the final night at Woods Hole, Arakawa stayed up in his motel room with printouts from the models by Hansen and Manabe blanketing his double bed. The discrepancy between the models, Arakawa concluded, came down to ice and snow. The whiteness of the world’s snowfields reflected light; if snow melted in a warmer climate, less radiation would escape the atmosphere, leading to even greater warming. Shortly before dawn, Arakawa concluded that Manabe had given too little weight to the influence of melting sea ice, while Hansen had overemphasized it. The best estimate lay in between. Which meant that the Jasons’ calculation was too optimistic. When carbon dioxide doubled in 2035 or thereabouts, global temperatures would increase between 1.5 and 4.5 degrees Celsius, with the most likely outcome a warming of three degrees. The publication of Jule Charney’s report, “Carbon Dioxide and Climate: A Scientific Assessment,” several months later was not accompanied by a banquet, a parade or even a news conference. Yet within the highest levels of the federal government, the scientific community and the oil-and-gas industry — within the commonwealth of people who had begun to concern themselves with the future habitability of the planet — the Charney report would come to have the authority of settled fact. It was the summation of all the predictions that had come before, and it would withstand the scrutiny of the decades that followed it. Charney’s group had considered everything known about ocean, sun, sea, air and fossil fuels and had distilled it to a single number: three. When the doubling threshold was broached, as appeared inevitable, the world would warm three degrees Celsius. The last time the world was three degrees warmer was during the Pliocene, three million years ago, when beech trees grew in Antarctica, the seas were 80 feet higher and horses galloped across the Canadian coast of the Arctic Ocean. The Charney report left Jim Hansen with more urgent questions. Three degrees would be nightmarish, and unless carbon emissions ceased suddenly, three degrees would be only the beginning. The real question was whether the warming trend could be reversed. Was there time to act? And how would a global commitment to cease burning fossil fuels come about, exactly? Who had the power to make such a thing happen? Hansen didn’t know how to begin to answer these questions. But he would learn. After the publication of the Charney report, Exxon decided to create its own dedicated carbon-dioxide research program, with an annual budget of $600,000. Only Exxon was asking a slightly different question than Jule Charney. Exxon didn’t concern itself primarily with how much the world would warm. It wanted to know how much of the warming Exxon could be blamed for. Shaw turned to Wallace Broecker, a Columbia University oceanographer who was the second author of Roger Revelle’s 1965 carbon-dioxide report for Lyndon Johnson. In 1977, in a presentation at the American Geophysical Union, Broecker predicted that fossil fuels would have to be restricted, whether by taxation or fiat. More recently, he had testified before Congress, calling carbon dioxide “the No.1 long-term environmental problem.” If presidents and senators trusted Broecker to tell them the bad news, he was good enough for Exxon. The company had been studying the carbon-dioxide problem for decades, since before it changed its name to Exxon. In 1957, scientists from Humble Oil published a study tracking “the enormous quantity of carbon dioxide” contributed to the atmosphere since the Industrial Revolution “from the combustion of fossil fuels.” Even then, the observation that burning fossil fuels had increased the concentration of carbon in the atmosphere was well understood and accepted by Humble’s scientists. What was new, in 1957, was the effort to quantify what percentage of emissions had been contributed by the oil-and-gas industry. The American Petroleum Institute, the industry’s largest trade association, asked the same question in 1958 through its air-pollution study group and replicated the findings made by Humble Oil. So did another A.P.I. study conducted by the Stanford Research Institute a decade later, in 1968, which concluded that the burning of fossil fuels would bring “significant temperature changes” by the year 2000 and ultimately “serious worldwide environmental changes,” including the melting of the Antarctic ice cap and rising seas. It was “ironic,” the study’s authors noted, that politicians, regulators and environmentalists fixated on local incidents of air pollution that were immediately observable, while the climate crisis, whose damage would be of far greater severity and scale, went entirely unheeded. The ritual repeated itself every few years. Industry scientists, at the behest of their corporate bosses, reviewed the problem and found good reasons for alarm and better excuses to do nothing. Why should they act when almost nobody within the United States government — nor, for that matter, within the environmental movement — seemed worried? Besides, as the National Petroleum Council put it in 1972, changes in the climate would probably not be apparent “until at least the turn of the century.” The industry had enough urgent crises: antitrust legislation introduced by Senator Ted Kennedy; concerns about the health effects of gasoline; battles over the Clean Air Act; and the financial shock of benzene regulation, which increased the cost of every gallon of gas sold in America. Why take on an intractable problem that would not be detected until this generation of employees was safely retired? Worse, the solutions seemed more punitive than the problem itself. Historically, energy use had correlated to economic growth — the more fossil fuels we burned, the better our lives became. Why mess with that? But the Charney report had changed industry’s cost-benefit calculus. Now there was a formal consensus about the nature of the crisis. As Henry Shaw emphasized in his conversations with Exxon’s executives, the cost of inattention would rise in step with the Keeling curve. Wallace Broecker did not think much of one of Exxon’s proposals for its new carbon-dioxide program: testing the corked air in vintage bottles of French wine to demonstrate how much carbon levels had increased over time. But he did help his colleague Taro Takahashi with a more ambitious experiment conducted onboard one of Exxon’s largest supertankers, the Esso Atlantic, to determine how much carbon the oceans could absorb before coughing it back into the atmosphere. Unfortunately, the graduate student installed on the tanker botched the job, and the data came back a mess. Shaw was running out of time. In 1978, an Exxon colleague circulated an internal memo warning that humankind had only five to 10 years before policy action would be necessary. But Congress seemed ready to act a lot sooner than that. 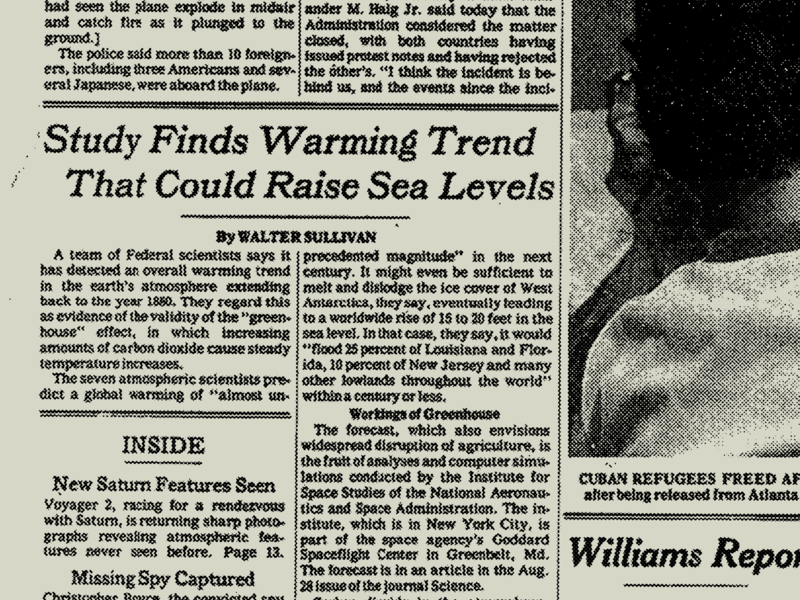 On April 3, 1980, Senator Paul Tsongas, a Massachusetts Democrat, held the first congressional hearing on carbon-dioxide buildup in the atmosphere. Gordon MacDonald testified that the United States should “take the initiative” and develop, through the United Nations, a way to coordinate every nation’s energy policies to address the problem. That June, Jimmy Carter signed the Energy Security Act of 1980, which directed the National Academy of Sciences to start a multiyear, comprehensive study, to be called “Changing Climate,” that would analyze social and economic effects of climate change. More urgent, the National Commission on Air Quality, at the request of Congress, invited two dozen experts, including Henry Shaw himself, to a meeting in Florida to propose climate policy. It seemed that some kind of legislation to restrict carbon combustion was inevitable. The Charney report had confirmed the diagnosis of the problem — a problem that Exxon helped create. Now Exxon would help shape the solution. Two days before Halloween, Rafe Pomerance traveled to a cotton-candy castle on the Gulf of Mexico, near St. Petersburg, Fla, that locals called the Pink Palace. 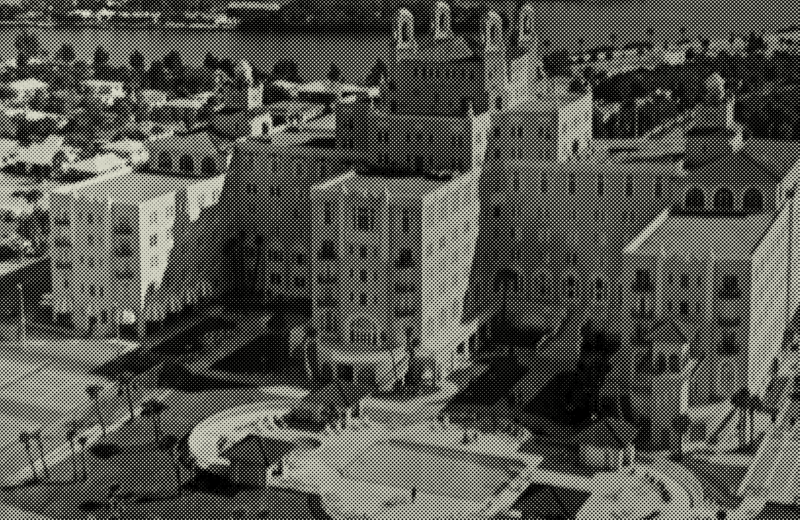 The Don CeSar hotel was a child’s daydream with cantilevered planes of bubble-gum stucco and vanilla-white cupolas that appeared to melt in the sunshine like scoops of ice cream. The hotel stood amid blooms of poisonwood and gumbo limbo on a narrow spit of porous limestone that rose no higher than five feet above the sea. In its carnival of historical amnesia and childlike faith in the power of fantasy, the Pink Palace was a fine setting for the first rehearsal of a conversation that would be earnestly restaged, with little variation and increasing desperation, for the next 40 years. In the year and a half since he had read the coal report, Pomerance had attended countless conferences and briefings about the science of global warming. But until now, nobody had shown much interest in the only subject that he cared about, the only subject that mattered — how to prevent warming. In a sense, he had himself to thank: During the expansion of the Clean Air Act, he pushed for the creation of the National Commission on Air Quality, charged with ensuring that the goals of the act were being met. One such goal was a stable global climate. The Charney report had made clear that goal was not being met, and now the commission wanted to hear proposals for legislation. It was a profound responsibility, and the two dozen experts invited to the Pink Palace — policy gurus, deep thinkers, an industry scientist and an environmental activist — had only three days to achieve it, but the utopian setting made everything seem possible. The conference room looked better suited to hosting a wedding party than a bureaucratic meeting, its tall windows framing postcard views of the beach. The sands were blindingly white, the surf was idle, the air unseasonably hot and the dress code relaxed: sunglasses and guayaberas, jackets frowned upon. The front page of The New York Times on Aug. 22, 1981. “I have a very vested interest in this,” said State Representative Tom McPherson, a Florida Democrat, introducing himself to the delegation, “because I own substantial holdings 15 miles inland of the coast, and any beachfront property appreciates in value.” There was no formal agenda, just a young moderator from the E.P.A. named Thomas Jorling and a few handouts left on every seat, including a copy of the Charney report. Jorling acknowledged the vagueness of their mission. “We are flying blind, with little or no idea where the mountains are,” he said. But the stakes couldn’t be higher: A failure to recommend policy, he said, would be the same as endorsing the present policy — which was no policy. He asked who wanted “to break the ice,” not quite appreciating the pun. This provoked huffy consternation. “In caring or not caring,” said John Laurmann, a Stanford engineer, “I would think the main thing is the timing.” It was not an emotional question, in other words, but an economic one: How much did we value the future? We have less time than we realize, said an M.I.T. nuclear engineer named David Rose, who studied how civilizations responded to large technological crises. “People leave their problems until the 11th hour, the 59th minute,” he said. “And then: ‘Eloi, Eloi, Lama Sabachthani?’ ” — “My God, my God, why hast thou forsaken me?” It was a promising beginning, Pomerance thought. Urgent, detailed, cleareyed. The attendees seemed to share a sincere interest in finding solutions. They agreed that some kind of international treaty would ultimately be needed to keep atmospheric carbon dioxide at a safe level. But nobody could agree on what that level was. William Elliott, a NOAA scientist, introduced some hard facts: If the United States stopped burning carbon that year, it would delay the arrival of the doubling threshold by only five years. If Western nations somehow managed to stabilize emissions, it would forestall the inevitable by only eight years. The only way to avoid the worst was to stop burning coal. Yet China, the Soviet Union and the United States, by far the world’s three largest coal producers, were frantically accelerating extraction. “Do we have a problem?” asked Anthony Scoville, a congressional science consultant. “We do, but it is not the atmospheric problem. It is the political problem.” He doubted that any scientific report, no matter how ominous its predictions, would persuade politicians to act. Pomerance glanced out at the beach, where the occasional tourist dawdled in the surf. Beyond the conference room, few Americans realized that the planet would soon cease to resemble itself. After lunch, Jorling tried to focus the conversation. What did they need to know in order to take action? David Slade, who as the director of the Energy Department’s $200 million Office of Carbon Dioxide Effects had probably considered the question more deeply than anyone else in the room, said he figured that at some point, probably within their lifetimes, they would see the warming themselves. Scoville pointed out that the United States was responsible for the largest share of global carbon emissions. But not for long. “If we’re going to exercise leadership,” he said, “the opportunity is now.” One way to lead, he proposed, would be to classify carbon dioxide as a pollutant under the Clean Air Act and regulate it as such. This was received by the room like a belch. By Scoville’s logic, every sigh was an act of pollution. Did the science really support such an extreme measure? Most everybody else seemed content to sit around. Some of the attendees confused uncertainty around the margins of the issue (whether warming would be three or four degrees Celsius in 50 or 75 years) for uncertainty about the severity of the problem. As Gordon MacDonald liked to say, carbon dioxide in the atmosphere would rise; the only question was when. The lag between the emission of a gas and the warming it produced could be several decades. It was like adding an extra blanket on a mild night: It took a few minutes before you started to sweat. Yet Slade, the director of the Energy Department’s carbon-dioxide program, considered the lag a saving grace. If changes did not occur for a decade or more, he said, those in the room couldn’t be blamed for failing to prevent them. So what was the problem? “You’re the problem,” Pomerance said. Because of the lag between cause and effect, it was unlikely that humankind would detect hard evidence of warming until it was too late to reverse it. The lag would doom them. “The U.S. has to do something to gain some credibility,” he said. “So it is a moral stand,” Slade replied, sensing an advantage. “Call it whatever.” Besides, Pomerance added, they didn’t have to ban coal tomorrow. A pair of modest steps could be taken immediately to show the world that the United States was serious: the implementation of a carbon tax and increased investment in renewable energy. Then the United States could organize an international summit meeting to address climate change. This was his closing plea to the group. The next day, they would have to draft policy proposals. “Will occur,” proposed Laurmann, the Stanford engineer. “What about the words: highly likely to occur?” Scoville asked. “Almost sure,” said David Rose, the nuclear engineer from M.I.T. “Highly or extremely likely to occur,” Pomerance said. Yet these two dozen experts, who agreed on the major points and had made a commitment to Congress, could not draft a single paragraph. Hours passed in a hell of fruitless negotiation, self-defeating proposals and impulsive speechifying. Pomerance and Scoville pushed to include a statement calling for the United States to “sharply accelerate international dialogue,” but they were sunk by objections and caveats. Pomerance had seen enough. A consensus-based strategy would not work — could not work — without American leadership. And the United States wouldn’t act unless a strong leader persuaded it to do so — someone who would speak with authority about the science, demand action from those in power and risk everything in pursuit of justice. Pomerance knew he wasn’t that person: He was an organizer, a strategist, a fixer — which meant he was an optimist and even, perhaps, a romantic. His job was to assemble a movement. And every movement, even one backed by widespread consensus, needed a hero. He just had to find one. The Antarctic Peninsula, where about three million pairs of penguins breed, is one of the most quickly warming areas on the planet; its average temperature has increased by five degrees Fahrenheit over the past 75 years. Many scientists believe that this warming will endanger some penguin colonies in two ways: dwindling food and loss of nesting habitats. On the rocky shores of Deception Island, where the penguins breed, they need cold, dry land for their eggs to survive, but rising temperatures have introduced rain and pools of water to nesting sites. And because of the rapid loss of sea ice, krill — the tiny crustaceans that serve as penguins’ main source of food — can’t sustain the large colonies they need to thrive. The penguin population of Baily Head, in the northern part of Antarctica, seems to have dropped from 85,000 breeding pairs in 2003 to 52,000 seven years later, a decline of almost 40 percent. Scientists fear that as warm water shifts farther south along other coastal regions, larger populations of penguins could face a similar decline. Photographs by George Steinmetz for The New York Times.